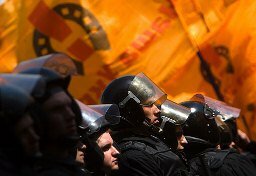 The Orange Revolution was the zenith of Ukrainians’ resentment over blatant manipulation of the 2004 presidential election in Ukraine and the subsequent vote-counting fraud. The crony system of the outgoing President Leonid Kuchma and his administration had alienated civil society, including a rising middle class frustrated by a growing suppression of political and economic rights. Their nonviolent pressure and direct challenge paved the way for a new political team to take power with the promise of democracy, rule of law and integration with the European Union. It soon became clear to a large swath of society that the Orange government was not prepared to implement radical reforms and was using its newly acquired political power to preserve and expand its own political and economic interests. Disagreement inside the Orange camp, which saw Yushchenko designating his former archrival Yanukovych prime minister in 2008 - with the majority in parliament unwilling or unable to push for bolder changes - led to disillusionment in much of civil society and further withdrawal from politics. Media organizations – one of the main beneficiaries of the Orange victory that ended overt and self-imposed censorship in media, which was common under Kuchma – began finally to exercise their rightful role as a watchdog of the new government. Print and online media became important democratic outlets, which started highlighting incompetence and corrupt practices of the new political class. Paradoxically enough, democratic freedoms in the media helped to show how imperfect the political leadership was that claimed to defend democracy. Yushchenko’s presidency missed a window of opportunity to push for comprehensive reforms similar in their scope and impact to the ‘big-bang’ transformation that took place in Poland soon after Solidarity took power in 1989. Eventually, the ‘people power’ that brought Yushchenko to Ukraine’s presidency also brought it down, albeit through conventional politics. In the 2010 presidential elections the incumbent secured merely 5% of the votes, ending his own re-election bid in humiliating defeat. Voters also punished his former Orange ally Yulia Tymoshenko by electing Viktor Yanukovych as president of Ukraine. The ascendance of Yanukovych brought to power those who were hungry for wealth and ready to curtail freedoms to secure it quickly and in vast amounts. Various organizations and activists voiced their criticism of the use of Ukrainian security services (SBU) to intimidate individuals and civic institutions. In the latest example, Olga Aivazovska, one of the leaders of Opora, a network of civic activists, described how SBU contacted some of her organization’s members before local elections and questioned them about their activities and meetings, including Olga’s recent travels abroad. Growing pressure from the security apparatus has been paralleled by a chillier climate for media. Censorship, harassment and sometimes violence against journalists are growing. At the same time, the new president wasted no time in consolidating and enlarging his own political power. Within nine months Yanukovych extended his control over legislative, executive and judicial institutions, including the constitutional court, and pushed successfully for changes in the constitution that gave him expanded and almost unchecked powers. The government’s actions, according to Svitlana Zalischuk, a coordinator of the New Citizen initiative and an activist in the Stop Censorship campaign, heightened conflict between the Yanukovych administration and civil society, which is now blamed by the current government for undermining Ukraine’s image abroad. In an atmosphere of lingering, deep public disenchantment with the Ukrainian political class, combined with shrinking political space, civil society seems to be reinventing itself. It has become less dominated by ‘grant-eating’ NGOs or activities that aimed at directly challenging a particular political group. Civil society’s activities are now driven by actions of concerned individuals who often launch ad-hoc social or economic (and seemingly non-political) initiatives and projects to deal with specific problems such as the environment (‘Green Front’ in Kharkiv), improvement of communal services (‘Opora’), challenging illegal distribution of land for new residential projects (‘Save Old Kyiv’), addressing specific cases of police violence and offering assistance for youths to increase their job marketability (‘Foundation for Regional Initiatives’), or organizing against a new tax code that aims at undermining independent entrepreneurs and small and medium-size businesses (‘Vidsich’). Political campaigns do take place but they are not frequent, massive or even well-organized, and they remain private initiatives, as civil society avoids being used by the political opposition to serve its own ends. Vitaliy Shabunin, the head of the Foundation for Regional Initiatives, has pointed out that during recent student demonstrations against the government’s plans to introduce penalty fees for missing classes, the organizers prompted their supporters not to display signs of political opposition and asked them to take down opposition flags. This emphasis on non-political protests is now quite common. To mobilize groups around specific issues, individual Ukrainians use Facebook and other social media and stage usually short-lived flash mobs such as ‘a white T-shirt’ gathering in October to protest government policies directed against the Ukrainian language, the presence of the Russian fleet in Crimea, the politicization of courts, etc. The 2004 Orange Revolution released the power of Ukrainian society, and that power is far from dormant. Civil society lost its focus after the disappointment with the Orange government and distanced itself from the political establishment, which has helped Yanukovych. Ukrainian civil society is however alive and well. Through its engagement in social and economic issues, notwithstanding a general withdrawal from politics, civil society is in a phase of protecting itself, guarding its ideas, rights and interests. It is a time when new things are tried and force is less visibly accumulated, says Volodymyr Horbach. In that sense, civil society may be reformatting itself, to develop perhaps a more potent civic power for future use, more well connected to the grassroots level and increasingly enriched by the practical experience of dealing with problems and grievances of local communities and ordinary people. All this will be helpful when civil society awakens again politically once circumstances demand it.